The 7 story Dayanta known as the Great Wild Goose Pagoda ( or simply Big Goose ) is situated four kilometers away from the center of the Xian city. The pagoda is one of the city's most distinctive and outstanding landmarks, possibly the most beautiful building left in Xian today. The famous Buddhist monk Xuan Zang returned from a 17 year pilgrimage and the square pagoda was built in 652 AD within the compound of the Benevolence Temple to house the 600 Buddhist texts that he had collected in India. The pagoda boasted a brick structure of five storeys and about 60 meters (197 feet) high. Above the stone doors at the bottom of the tower, there remain the exquisite line-etched pictures from the Tang Dynasty. 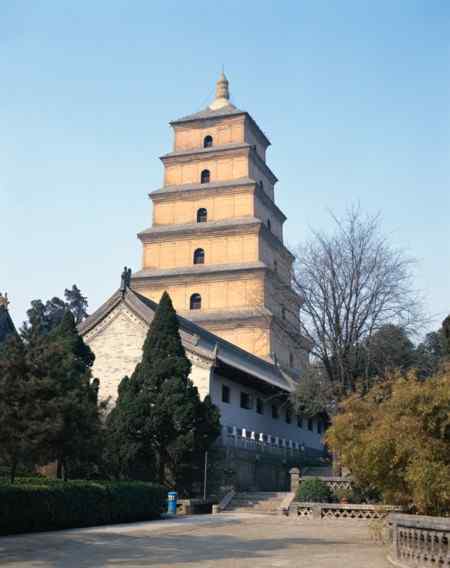 The bottom of the pagoda resembles a wild goose, hence the name, the Big Wild Goose Pagoda. Xuan Zang is a household name in China. The famous novel "A Journey to the West" is based on his long journey to India.